Steps to the water on the west shore! Just past Homewood and a beach walk away from Chamber's Landing. This fully equipped cabin is clean and classic. Step back in time and remember when vacations were easy! 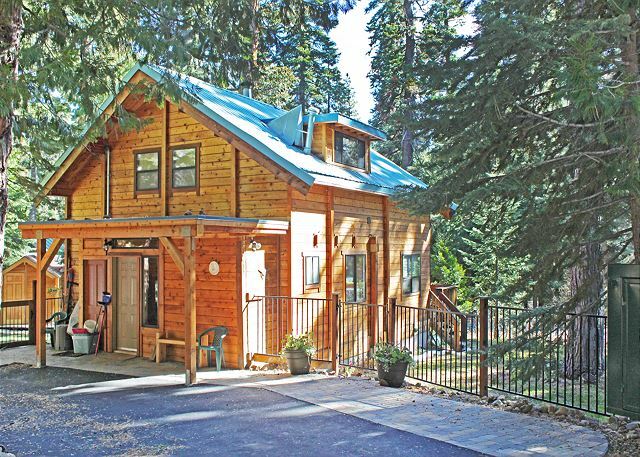 Tucked away in Tahoe Park, this remodeled cabin offers hardwood floors, wood burning stove, and outdoor space in the fenced yard. Walk to markets, restaurants and Tahoe Park HOA beach areas. The mountain modern exterior welcomes you to this great property. Enjoy the spacious sunny deck on a quiet street bordering vacant land. Access to Tahoe Park private HOA beach area just down the hill or back country trails thru the neighborhood. Single story living at the top of Talmont! Fully equipped and updated to make your vacation enjoyable. Open floorplan with rock fireplace leads to a spacious deck. Walk to Paige Meadows and miles of trails just one block up. Close to Tahoe City too! Fully equipped Old Tahoe cabin in a convenient location. Get cozy around the wood burning fireplace or enjoy the outdoors on the large deck. Walk to nearby restaurants, markets or Tahoe Park HOA beach area. Level access and a quiet street in Pineland lead to this fully equipped 3 bedroom, 2 bath home. Living areas and one bedroom and bath are located on the main level. There is a wood burning fireplace to warm you up on those cool winter nights! Aspen Grove is a wonderful cabin in the desirable Tahoe Pines neighborhood. Come enjoy this remodeled home any time of year! It's fully equipped with washer, dryer, dishwasher, disposal, gas range, smart television with cable & netflix, gas f/p and WIFI. Relax in front of the gas fireplace in this equipped 3 bedroom, 2 bath cabin in Tahoma. Walk to HOA pier and beach area or Sugar Pine Point State Park trail system. Close to Homewood for your winter adventures! Quiet location and great outdoor space with deck and fully fenced backyard. Open floorplan and wood burning fireplace. Walking distance to the lake and a 1 car garage. Pre-approved dogs allowed.